A useful guide with examples for published statistics and datasets in different styles such as APA and ASA. From Emory University, especially strong in source-specific formats, general guidelines and other specific source examples. There is not yet a universally recognized way to cite data. It is best to follow the guidelines of the style you are using to the extent that it addresses data. Beyond that, here are some good examples to follow. The essential elements of a data citation along with some examples, from the DataCite organization. A guide with a helpful diagram from Lafayette's library. 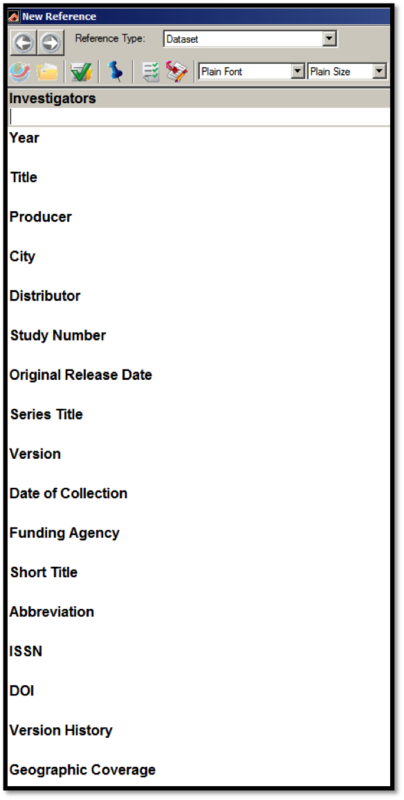 "Why and How Should I Cite Data"
See the example for "machine readable data file" and guidance for tables and figures. "It is the policy of the American Economic Review to publish papers only if the data used in the analysis are clearly and precisely documented and are readily available to any researcher for purposes of replication. Authors of accepted papers that contain empirical work, simulations, or experimental work must provide to the Review, prior to publication, the data, programs, and other details of the computations sufficient to permit replication. " "6.1 Data access: Researchers making evidence-based knowledge claims should reference the data they used to make those claims. If these are data they themselves generated or collected, researchers should provide access to those data or explain why they cannot. See esp. section 5 "References" under Manuscript Submission, Manuscript Preparation. "References for data sets should include a persistent identifier, such as a Digital Object Identifier (DOI). Alliance for the Social Sciences (Data-PASS). Refer to the ASA Style Guide (4th. ed., 2010) for additional examples:�"
Political and Social Research [distributor], 2000. doi:10.3886/ICPSR06849. EndNote, Zotero and Mendeley all have a resource type for datasets. So, when you are building your bibliography of journal articles, books, documents, web pages, etc., be sure to document your data sources, too!